My mother is my life. 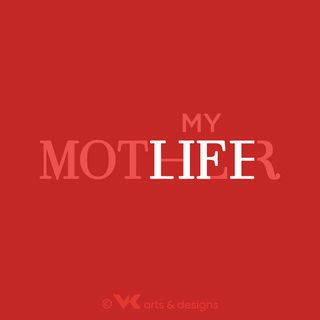 Is “My mother is my life” grammatically, morally, ethically right to say this? Mother is a very important person for everyone. So I don't want to make a mistake while using such phrase. I am asking this because I couldn't find Google search results for this phrase. Is it correct to use it? Grammatically, your sentence is fine. Morally and ethically, I don’t think you will find too many people who will argue that it’s wrong to honor your parents – especially on Mother’s Day. That all said, I do think the phrase might sound a little bit awkward, depending on what you are trying to say. The phrase “is my life” implies that you are pouring your energy into something. If a mother of three young children were to say, “My children are my life,” that sounds more accurate, as most mothers of toddlers need to invest a lot of energy into taking care of their children. It’s a demanding and tiring job. Most adults don’t usually invest the same kind of energy into taking care of their parents, unless perhaps their parents are becoming elderly and infirm. So, in my mind, the phrase is grammatically okay, but I think you risk using flowery language that sounds more overstated than accurate. My mother is very important to me. I am so thankful for my mother. My mother is my life is OK, especially if you mean my whole life is my mother, I live my mother. Note that a person who is very religious might say The Church is my life. It means the Church always comes first and there is nothing more important than that. If you have a meaning like that on your mind, of course you are free to use the phrase My mother is my life. My mother is my everything / my angel / my treasure. There is no other like my mother. My mother is the most important person in my life. 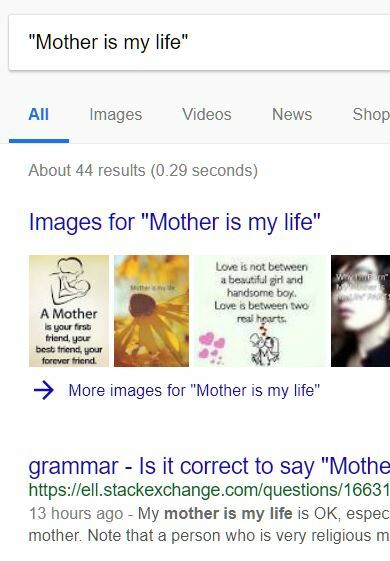 I typed "Mother is my life" into Google and got 42 hits. If you surround text with quotes Google looks for an exact match. Many of these show "My mother is my life", but the phrase is equally applicable (fine) without "My". If you say that something or someone is your life, you are emphasising that they are extremely important to you. The Church is my life. "Mother is my life" means your mother. It is grammatically correct but it is not contextually or culturally correct for Mother's Day or as a form of praise. If you are trying to thank your mother, it is not a good idea to make comments that sound as if you are talking to someone about your mother, which is what your sentence sounds like. If it's Mother's Day, you want to address her directly. And that phrase is not right in terms of direct address. Of all the ways of saying your mother has played an important role is getting you to a certain point in your life or how important she has been, that is not the phrase to use. It is very, very weird in the English-speaking world to say that. Over-attachment to mothers is a serious psychological condition. The movie Psycho by Hitchcock is an extreme example of this phenomenon. I do not want to write the card for you to your mother, but I suggest you find another sentence. However, the sentence might sound more like: "Mother, you are a very important person for me." In any case, I would use direct address and not indirect address. "Thanks for being such a great Mother!". "Thanks for being my mother!". Not the answer you're looking for? Browse other questions tagged grammar phrase-meaning usage phrases or ask your own question. Can “mistake(n) as” “mistake(n) for” “mistake(n) with” be used indifferently? “A better future tomorrow” vs “a better tomorrow”?